Our St. Joseph location is at 3007 North Belt Hwy #H, St. Joseph, MO 64505. This location is located off of 1-29 at t he Frederick Avenue exit . Go west on Frederic Avenue and then go north on North Belt Hwy, we are located on the right north of K-Mart in the Swiss Highlands Shopping Center. The St. Joseph location has a small town atmosphere. Many of our clients are local business employees and local farmers. 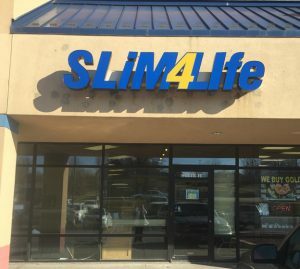 At Slim4Life, we focus on individualizing our weight loss program for each client and meeting with each client one on one. Our goal is to teach clients how to stay Slim4Life. The St. Joseph staff is dedicated to their clients long term results. They want a client to lose weight rapidly, keep the weight off and refer their friends and family to Slim4Life. Make an appointment at our St. Joseph weight loss center today!